Here's a little information about our group, officially known as the Pacific Northwest Chapter (or PNWC for short). The PNWC was formed in 1955 as a non-profit Oregon corporation. Founders of our Chapter said their objectives would be "...to preserve historical materials of railway transportation; to collect data on the history of transportation and to issue publications relating to this subject; to encourage rail transportation; and to acquire real and personal property appropriate for a museum and the purposes listed above." Fifty years later we are still going strong, with roughly 250 members, a remarkable library, archives, and over a dozen pieces of rolling stock. Our members range in age from 16 years old to over 90 years young. We are affiliated with the National Railway Historical Society (or NRHS for short). The NRHS is a non-profit organization, which was formed in 1935 for historical and educational purposes. The Pacific Northwest Chapter is one of more than 171 affiliates (total as of 1996), mostly located within the United States but also with some Chapters in Canada and Europe. 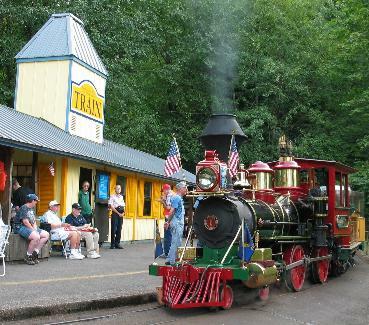 Click the link to the National Railway Historical Society for more information, but not before you bookmark our page! Any person age 16 or older and with an interest in railroading is eligible for membership. Members receive the monthly Chapter newsletter, The Trainmaster and also the National Railway Bulletin published by NRHS. Meetings of the membership are held every month, usually on the third Friday. Visitors are warmly welcomed! Typically, we first address the general business of the Chapter. This can be a great time to learn about not only what the PNWC is doing, but also what other rail-related groups are doing in the region and around the world. We then break for refreshments, and after the break we have the program. Monthly programs are always interesting and often feature guest speakers, multimedia presentations or videos selected from our extensive library. See the Calendar for dates, times, and locations. The Chapter is governed by a Board of Directors, headed by Chapter Officers in the positions of President, Vice President, Secretary, Treasurer, National Director, as well as a special position reserved for the former President for one year after his/her term ends. Officers serve one-year terms, Directors At Large serve three-year terms. All of these are positions elected by the general Membership at the December membership meeting. Board of Directors meetings are held every month, usually on the Thursday one week prior to the Membership meeting. Unlike the monthly Membership meeting, the Board of Directors Meeting is not open to the general public. All PNWC members are welcome and invited to attend. See the Calendar for dates, times, and locations. 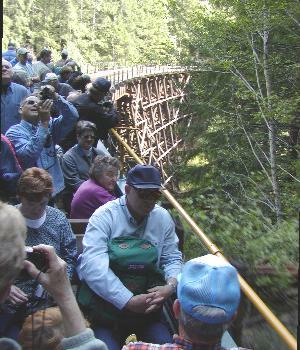 The Chapter operates one or more railroad excursions each year with tickets on sale to the public. This activity is undertaken as a major fundraiser for the Chapter. This picture was taken on Port of Tillamook Bay Excursion which is a specialty of the PNWC! You can see the popularity of the open air car on this trip.